The Emergency Department is covered by an on-call medical care provider and trained nurses who are certified in Advanced Cardiac Life Support, Trauma Nursing Core Course and Pediatric Advanced Life Support. Our Emergency Room is fully equipped to handle emergencies in the community. A helicopter landing pad to ensure proper transport to larger hospitals if necessary. We understand that visiting an Emergency Department isn’t an enjoyable experience. 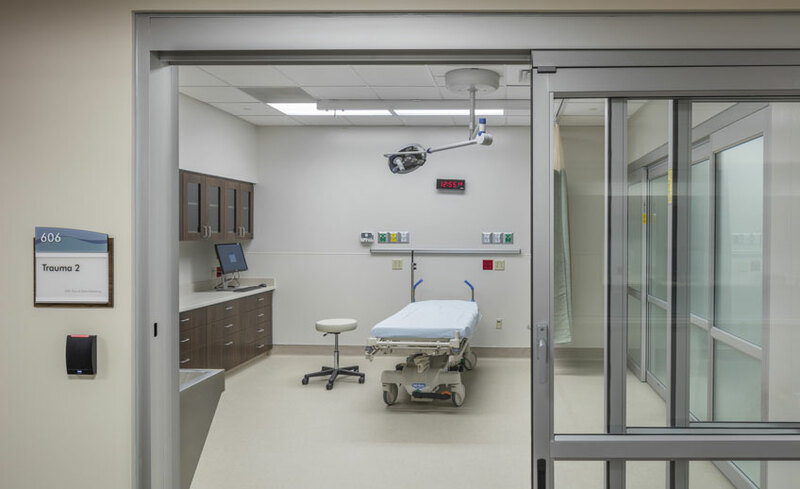 We hope to make your experience a better one by explaining how the Emergency Department operates so you have an idea of what to expect while you are here. Whether you arrive by ambulance or private vehicle, a highly trained nurse will determine the severity of your illness or injury and assess you as quickly as possible. A nurse will ask you the reason for your visit and take down important information about your medical history, including information on allergies. You will be asked to sign routine paperwork which may include parental consent for children under 18 years of age. The nurse will also take your vital signs, including temperature, pulse, blood pressure. For small children and infants, a rectal temperature is taken for the most accurate information. The purpose of this assessment is to make an initial determination about the nature and severity of your illness or injury. The triage assessment determines the order in which you will receive a medical screening examination. If a bed is immediately available, you will be registered at the bedside. If a bed is not immediately available, you will be asked to take a seat in the waiting room until one becomes available. If you begin to feel worse, please notify the ER nurse immediately. ER physicians, physicians assistants, nurse practitioners, nurses, and technical staff are highly skilled professionals; one will examine you as soon as possible after you are placed in a bed. However, they may be delayed if more critical patients arrive unexpectedly. Your physicians or physician’s assistant will order tests / procedures, x-rays, etc. that he / she feels necessary. Some tests require blood to be drawn, while others may require you to go to another department. A trained technician will be with you at all times if you need to leave the Emergency Department for tests in another part of the facility. Obtaining results of tests and completing procedures takes time. If you do not understand a specific procedure, please ask your physician or nurse. As soon as your lab work or imaging results are available, your medical care team will explain the findings. Occasionally, an additional test may be necessary. Depending on your particular condition, your treatment may be simple or complex. The treatment, which may be carried out by the physician, physician’s assistant, nurse practitioner or nurse, may consist of splints, bandages, IV’s, or medications. It may take a few minutes or several hours depending on your illness or injury and the presence of other critical patients. Your ER medical care team may speak with your family doctor or other specialist about your treatment. Sometimes calls to other doctors cause delay, especially if they are unable to answer our calls immediately. Your primary care physician will determine if you are to be admitted to the hospital. If you are admitted to the hospital and it is full, you may have to wait in the Emergency Department for another patient to be discharged . As soon as a room is prepared, we will take you to your room. If you are discharged home, the nurse will provide you with a copy of your discharge instructions and any prescriptions the physician or physician’s assistant has written for you. The nurse will explain your instructions and prescriptions and answer any questions about your care or treatment. You are responsible for your own care after you leave the Emergency Department.